Parents are at risk of being misled by "manipulative marketing campaigns" and "crafty messaging" on children's snacks, a child health expert has said. Dr Max Davie said that given levels of obesity, it was crucial for parents to know what their children were eating. It comes as University of Glasgow researchers examined seemingly healthy children's snacks sold in UK shops. They found some snacks labelled as containing one portion of fruit or veg did not live up to the claim. Scientists and doctors say more stringent regulation is needed. The team examined more than 300 products aimed at children (with cartoons on packing for example), including 41 different brands, sold at seven major UK supermarkets between 2016 and 2017 . They included many snacks with healthy messages on them such as fruit snacks, fruit drinks, cereal bars and cereals, but excluded obviously unhealthy choices such as cakes and confectionery. Researcher Dr Ada Garcia told the BBC: "At the moment some companies are using health messaging to make products more attractive to people, but they do not always live up to those claims. "It is important parents don't look at the claims in isolation but look at all the ingredients on the pack and judge the whole quality of the food." The report highlighted a number of concerns. One was the packaging on 80 fruit-based drinks and snacks claiming to contain no added sugar, but more than 40 had concentrated fruit juice or fruit puree as added ingredients. Dr Garcia added: "Some people will see processed fruits as a healthy alternative snack but the sugars in highly processed fruit and fruit juice are already broken down and so can be absorbed by the body more quickly. 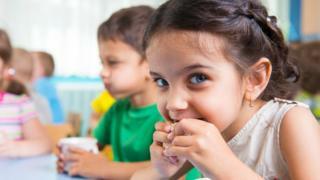 "This means children may become hungrier more quickly and these free sugars also contribute to tooth damage and tooth decay." She said the public needed clearer information on packaging. And while researchers acknowledge there is no standard portion size for children's fruit and vegetables, they say many fruit-based products had insufficient amounts of fruit and vegetables in them, despite claims they contained one of the government-recommended five portions a day. Meanwhile, Dr Davie, of the Royal College of Paediatrics and Child Health, said: "Given the UK's rising levels of childhood obesity, is it essential that parents and children know precisely what is in the products they consume and are not misled by manipulative marketing campaigns. "This study reveals concerning findings, particularly the disappointing levels of fruit and veg in products claiming to contain at least one portion of the government's recommended five-a-day. "It is clear that families are being influenced by surreptitious food packaging. We strongly support the researchers' call for stricter regulations on composition and labelling. "Alongside, there needs to be better education and advice available for parents so that they can see through crafty messaging and make their own decisions about what they consider to be healthy products for their families." Kate Halliwell, from the Food and Drink Federation, said a large proportion of products labelled as giving one of your five a day were also classed as healthy under advertising rules. "The fact that many are high in sugar is no surprise given fruit contains naturally occurring sugars," she said. "The weight of dried fruit and purees required to count as one of your five-a-day is based on being equivalent to 80g of the fresh product. Products containing dried fruit can therefore legitimately label 'five a day' if they have 30g of dried fruit." She said the vast majority of companies provided more nutrition information than they were legally obliged to on the front of packs. The work is published in the journal the Archives of Disease in Childhood.